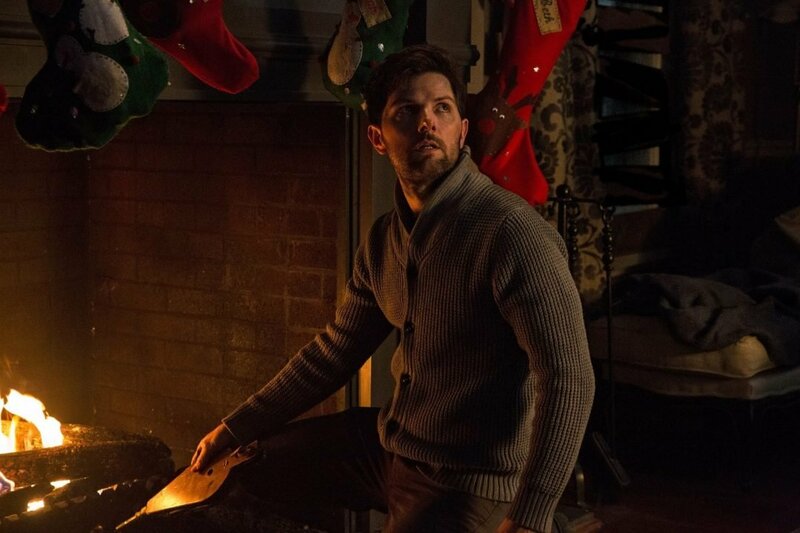 For years the ancient evil festive deity Krampus has been worming its way into the public conscience through pop culture and this week that special brand of Christmas evil finds its way into our bitter hearts on a mass scale through a self-titled Hollywood horror romp. It’s been a long time coming and thankfully, Krampus found the right people to bring him to the big screen. 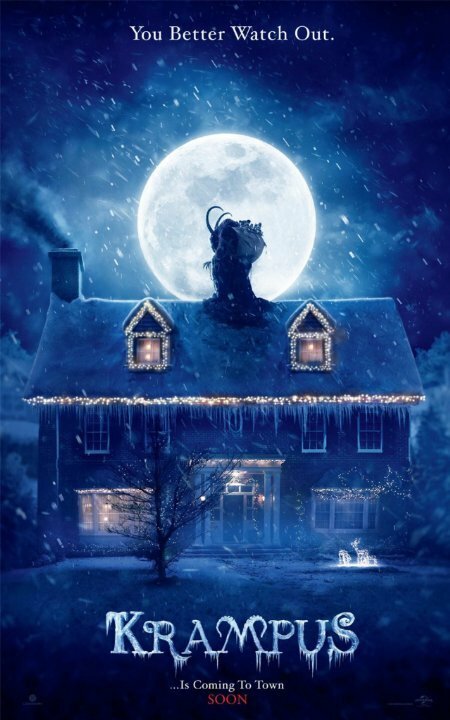 Produced by the modern monster movie factory Legendary Pictures (Pacific Rim, Godzilla, Jurassic World) and co-written/directed by Michael Dougherty (who previously proved his holiday horror worth through the delightfully naughty Trick r’ Treat), Krampus is an undeniably fun genre romp. Sure, the gorehounds will be disappointed by the PG-13 limitations of this Gremlins-style family horror film and it oddly feels more like a traditional Christmas movie than an unhinged lump of black coal. But at the same time, when there’s this much spooky fun and dysfunctional comedy spooling out on screens on a mass scale, it would take a particularly Scroogey Scrooge not to appreciate what the filmmakers accomplished. Dougherty kicks things off with a slow motion opening credits mission statement about the commercial horrors of Christmas. As a carol ironically fills the soundtrack, we see a stampede of holiday shoppers turn into a mini-riot, eventually landing on a fistfight in a nativity play. The kid at the centre of the fight is played by Emjay Anthony, a preteen still desperately clinging to Christmas magic with all his might. His family life makes it difficult to keep up the charade. His sister (Stefania LaVie Owen) ignores him, his father (Adam Scott) is overworked, his mother (Toni Collette) is overstressed, and his extended family make things even worse. Sure his aunt (Allison Tolman) is sweet, but her kids are monsters, her husband (David Koechner) is a right-wing nut, and her aunt (Conchata Ferrell) is a whiney alcoholic. No one is particularly happy about Christmas arriving again this year except for Anthony and his grandmother (Krista Stadler). When they lose their last pieces of holiday spirit, it means that someone other than Santa will be visiting. Yep, it’s Krampus time. Dougherty takes his time setting up the holiday horrors. Much of the first half of the film is dedicated the a parade of foul-mouthed family dysfunction that plays like The Ref-lite. Thanks to Dougherty’s knack for bitter comic dialogue and the overqualified cast, the sequences play out like barb-driven sparring matches and tensions rise. With a claustrophobic setting filled with bickering family members established, the supernatural elements come out to play and the movie transforms into a home invasion horror. Krampus appears cloaked in snowstorms and shadows at first, with his naughty little helpers doing his bidding. Though the filmmaker keeps things firmly planted in PG-13 horror land, the tone is of a splatstick Stuart Gordon/Sam Raimi/Joe Dante nature. It’s scary, but funny. A romp. And a good one too. Having started in animation, Dougherty has a knack for visual design. The film is beautifully constructed and the monsters are exquisitely designed. The helpers a perverse monster twists on beloved (and benign) holiday imagery like teddybears, jack-in-the-boxes, and gingerbread men. For the most part, Dougherty admirably creates the monsters through puppetry to lend them a creepy tactile quality and also firm up the 80s VHS horror tone. There are some spectacular monster set pieces that will plaster grins all over monster movie lovers’ faces and when the audience is finally given a chance to peek at Krampus up close and personal, the big bad doesn’t disappoint. Other touches like a stop motion Krampus flashback recall holiday specials of old through a horror lense in clever ways. Dougherty clearly loves Christmas tales as much as monster mashups and has created a giddy romp pitched somewhere between the two. Now, it should be noted that the ending and minimal use of blood might irk more seasoned (and desensitized) horror fans. This isn’t a gory, goopy endurance test. It’s actually an oddly traditional Christmas fairy tale told through monster movie trappings rather than a monster movie with a festive sheen. That’s an unexpected choice, yet one that works on its own terms. Given how stylistically accomplished and well-acted this thing is, it’s easy to imagine Krampus popping up on cable Christmas rotations alongside Gremlins. Even if it doesn’t quite hit the cynically absurdist heights of Joe Dante’s masterpiece, the fact that Dougherty delivered something that can be mentioned in the same breath is a pretty impressive achievement in and of itself. Despite the fact that the studios crank these things out every year, it’s been awhile since a holiday movie emerged with real potential staying power (probably stretching back to 2003’s one-two punch of Elf and Bad Santa). So it’s nice to have Krampus pop up to give kids a latex horror Christmas treat for years to come. It’s been a long time coming for this sweet winter demon to get a movie worthy of the legend. Thank God the folks put in charge of his cloven hooves and mischievous holiday spirit didn’t disappoint. Given how stylistically accomplished and well-acted this thing is, it’s easy to imagine Krampus popping up on cable Christmas rotations alongside Gremlins.